When you’re married, it’s inevitable that some things your partner does, or doesn’t do, will drive you nuts. It would be great if we could love everything our partner does, but it just won’t happen. Truthfully, if our partner did every single thing we wanted, it would be great at first, but then even that would become annoying! I absolutely adore my husband and am simultaneously extremely annoyed by some of the things he does at times. Some things about our partner are bound to get on our nerves, but how we talk about these things makes all the difference. What do most people do in these types of situations? 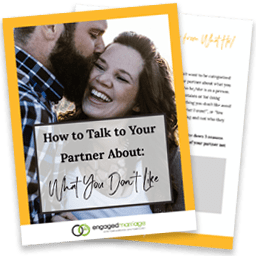 Most of us either don’t talk to our partner about what we don’t like and get resentful or we talk to our partner in a very blaming and non-helpful way. Today, I’ll show you how you can talk to your partner about anything that’s bothering you without starting World War III in your household. Throughout the article, I will use he and she interchangeably because both men and women could benefit from learning these strategies! Often, when we don’t like something our partner is doing, we criticize him as a person. Instead of telling him you don’t like that he leaves his dirty dishes on the counter, you tell him he’s selfish and uncaring. The key to talking to your partner about what you don’t like is to separate your partner’s behavior from who she is as a person. We all make mistakes and do stupid things. I don’t know about you, but I don’t want to be categorized based on all of the stupid things I’ve done. Your husband will at times in your marriage act selfish, uncaring, etc. I know I haven’t been a loving saint to my husband every minute of every day. We are all mistake-prone human beings. The beauty of life is that acting selfish once in awhile doesn’t make us selfish to the core. If your wife is yelling at you it doesn’t make her a “yeller” at heart. Are you annoyed by some of the things your spouse does? 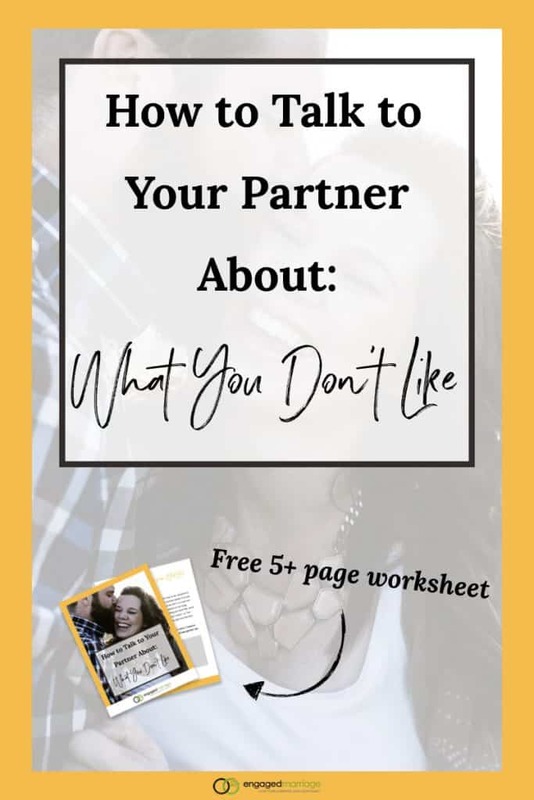 Enter your email below to get my workbook to learn how you can talk to your partner about anything that’s bothering you without starting World War III. I often counsel parents and one of the biggest things I see is children feeling like a failure because they failed a test or didn’t make the team. When the parents are able to separate their child from the child’s problematic behavior, it gives the child room to make mistakes and still have a sense of self worth. In fact, these parents can be more harsh on the unwanted behavior as long as they are still valuing the child overall and the same applies to your marriage. You can actually voice your concerns more strongly if you focus on what your partner is doing and not who your partner is as a person. Don’t turn your partner into a bad person for making mistakes or for doing something you don’t like. Instead, do just the opposite! Start the conversation by telling your partner what you like about her as a person or her behaviors in other areas. Give your partner desirable labels and a good reputation to live up to. You married this woman remember? What do you love about her? What attracted you to her? What little things does she do that you maybe take for granted? So, anytime you’re going to talk with your partner about something you’d like changed, start by reassuring her you’re okay as a couple. Tell her you love her and give her a good reputation overall. When something is bothering you, stick to sharing only what you’ve observed your partner DOING. Focus on your partner’s visible, indisputable behaviors. This is not the time to criticize or mind read her insides (intentions, desires, thoughts, feelings). Stick to talking about what you can see or hear. Beginning this way helps to avoid defensiveness and blaming. Next, you want to tentatively and vulnerably tell the other person the story that’s been playing in your mind about these observations. Be careful not to become defensive or blame the other person here. You just want to tell them the assumptions you’ve been making based on your observations. Use “I” statements while expressing how you’ve been feeling about these observations. Remember, this is your story about what has been happening. It is not a fact! Present your story as one of many possible explanations or stories for what you’ve been observing. After sharing your observations and feelings about the situation, genuinely ask the other person to express her story or views of the situation. It’s important to stay curious and want to learn your partner’s point of view rather than be right or win an argument. “Doing Wants” are what you would specifically like to see your partner doing. Tell your partner what you would like to see them do or say. “Doing Wants” are not used to tell your partner to change his insides (intentions, thoughts, feelings). This is like the famous line “I want you to WANT to do the dishes”. That won’t work. Just tell him you want him to do the dishes. Again stick to what you want them to specifically DO that you could see or hear. So, if you’re thinking “I want my partner to give me more attention” then get specific. What would giving you more attention look like to you? How can your partner DO “more attention”? Then let your partner know these specific actions. One important thing to remember is that “Doing Wants” are merely requests. You are telling your partner what you like and what works for you. That doesn’t necessarily mean she will be able to, or even want to, do it. “Doing Wants” are best delivered in with a non-demanding and loving attitude. Look for moments when you can catch your partner DOING something you appreciate. Look for mundane, taken for granted actions to praise your partner for. Tell your partner that you noticed and really liked it that she cleaned the cat box or made a delicious dinner, instead of just expecting it. Most importantly, if you catch your partner in the act of one of your “Doing Wants”, let him know you noticed and appreciate it, even if it wasn’t perfect. Remember, when you have relationship difficulties, take your target off your partner’s back and put it on his specific actions that you’d like to see change. This is the best way to get what you want…without getting a reaction you’d rather avoid. Download This Free Tip to Instantly Deepen Your Communication and Wow Your Spouse Tonight! I really like this and could have used it about 10 years ago. Though I guess it still applies. My husband and I are on the verge of our second divorce – yes, divorced once and married twice as of right now. I don’t want a second divorce, for myself or our children. Yet he has done something that most would not forgive. On top of that, he has now done something irreversible and very damaging. Between the two events, he seemed very upset about how selfish his behavior had become; yet this most recent action is extremely selfish. He told me he was doing it as a way to heal, but after expressing how hurtful it was to me, he told me that he didn’t care how I felt and he was going to do it anyway. And he did. Only it turned out even worse than even he had described, and it can’t be undone. How do I live with that? How do we stay married? How do we avoid WWIII? I thought this post was so helpful in breaking down step by step how to go about talking to your spouse about things you don’t like. Sometimes it can be hard to communicate those things how your really want to! My husband and I are getting better at this, it truly just takes practice. Thanks for the info. #4 While anyone certainly has the right to feel however they feel, the example strikes me as one that I wouldn’t share unless the context was much different. If I heard the example sentence, I would fear like I was getting guilted into a behavior change. If the example read something like “I have been feeling alone and less connected to you,” I wouldn’t be inclined to respond defensively. #5 What if the response is complete disagreement? How to proceed then? For example, when I get angry (fyi, infrequently) I speak louder and often faster. My wife feels like I’m yelling at her and wants me to stop. When she asks what my thoughts are, I explain that I’m not yelling at her, I’m upset at the situation and expressing my feelings verbally, intonation and all, is important for me to process my thoughts and feelings. How do you move forward when the response to #5 is antithetic and mutually exclusive? Ben, I agree that #4 & #5 are difficult to understand. I think on #4 the main point is to use “I” statements, regardless of how the example is worded. Your wording makes sense and you would know best how to present it to your spouse to prevent a defensive posture. You are presenting your feelings, which cannot be denied along with why you are feeling that way. There may still be guilt being felt by the other person, but that is why there are two sides to the story and the conversation becomes a volley of understanding to come to an agreement on how to move forward. This can also be done without either person getting overly emotional or animated. On #5 disagreement may be an expected response, which is why it is important to keep #4 & #5 together. Seeking to understand the other person’s point of view. Ultimately, it is not up to you to change the other person’s behavior, it is up to them to want to change their behavior for the sake of your relationship. It would probably be helpful for you to make a conscious effort to keep your tone and pace of voice in check, especially if your wife is intimidated by it and sees it as “yelling”. could be something in her past that invokes those thoughts & feelings. By keeping yourself in check for her sake will send her a message that you are willing to change to love her more fully with where she is at. At the same time you still are wanting to express your feelings about being upset, maybe isolating yourself and taking it out on a wall before confronting your wife will help relieve those emotions ahead of time. Take this for what you are paying for it. I am not a licensed therapist, just an average guy that has been working on his marriage for 21+ years. We are still trying to figure out this thing called marriage. you will be in my prayers. So well explained. I truly believe in the power of words and I feel ‘how you say it’ is more important than ‘what you say’. Conveying your thoughts without sounding rude or blaming is definitely an art. The best piece of advice that comes from this article is – separating the habits/behaviour from the person. I am surely going to make a note of it. Communication is key on a relationship, especially if you want it to be long-term. You really just have to know your partner and what offends them. But definitely find some way to tell them what you want them to change without making them feel like they’re doing things completely wrong. but whatever you do…don’t be this lady. I appreciate your guide and there are things I can benefit from to improve my marriage. One of the things I think is important is doing things routinely. When you only implement these strategies periodically they may come off as a little hokey I think it becomes clear with practice that there is a concerted effort to improve the relationship. very good advice but what if example: with myself and my partner. we are still young in the relationship but we both are taking it very serious. and I acknowledge that we both as well are doing everything to make it better. When a situation is a bit silly but is bothering me and I expressed to my partner how that attitude makes me feel uncomfortable, but he strongly disagrees. he says that by me asking him to not do it it is changing the way that he is. Obviously it still makes me feel very uncomfortable. However would it be fair for me to ask for it? I got married four years ago in California, his from Birmingham we moved here three years ago. He recently listed his daughter to drugs at the age of 40. He says nothing is going on with his Ex. But last night he was at her house drunkdrunk didn’t come home we have a house two cars,truck. No kids. I want to leave him I just hate to start over with nothing.